It only seems appropriate that I post about Turkish food today as I’m headed to Istanbul this afternoon. I know it’s only been two months since my last visit when I enjoyed my Breakfast by the Bosphorus, but I simply cannot stay away! Like a first love, Istanbul completely stole my heart when we lived there, and I miss my friends. Funny enough, I probably have cooked more Turkish food at our home here in Warsaw than I even did in Istanbul. I no longer can call up Ali Baba and get a quick dinner delivery or stop by the kebab vendor down the street. If I want Turkish food, I best make it myself. Sure, Warsaw is full of döner kebab vendors all over the city, but it’s definitely not the same. I don’t want some strange tomato or yogurt sauce in my döner. I’ve always loved Turkish mezes! So a few weeks ago, I invited a new couple over for dinner and decided to make kabak yoğurtlu (zucchini with yogurt), patlıcan salatası (roasted eggplant with yogurt) and Turkish shakshuka/şakşuka (fried eggplant with tomatoes and yogurt). Luckily, I’ve found several brands of thick Greek yogurt here that works quite well to substitute for Turkish yogurt. Here are my meze dishes of patlıcan salatası and kabak yoğurtlu. I turned to three of my favorite Turkish food bloggers for my recipes and inspiration – Claudia of A Seasonal Cook in Turkey, Ilke of Ilke’s Kitchen and Ozlem of Ozlem’s Turkish Table. 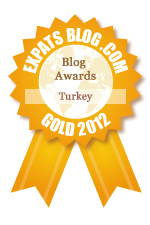 Luckily, I’ve met all of these lovely ladies in person when I lived in Istanbul and love reading their blogs from afar. I highly recommend checking them out for delicious Turkish recipes! I used a combination of recipes for the shakshuka/şakşuka from Ozlem and Claudia. Check out both recipes here: Fried aubergine eggplant, courgette and peppers with tomato sauce and Shakshuka Aubergine Meze. Be sure to serve plenty of bread with this meze as you'll want to eat every last drop of it! We can find decent eggplant here in Poland so I’ve used Claudia’s recipe several times now to make my own patlıcan salatası. So simple and so delicious! I use a mortar to crush my garlic with salt before mixing in with my yogurt. My market haul to make to make this Turkish meal at home. For the third meze, I used Ilke’s recipe for kabak yoğurtlu. This is another simple, but delicious recipe. For a salad course, I made this summery Turkish tomato-pomegranate salad called gavurdağı salad. I realize we also tried this yummy salad when we were on our southeast Turkey road trip last year in Gaziantep. Finally, for our main course, I made stuffed peppers Turkish-style…otherwise known as biber dolması, which is my version. I’ve made these dolmas so many times now that it’s easy enough to make vegetarian versions as well as differently spiced ones depending on what I have at home. Looks like no matter, where I live, I’ll always find a way to make some of my favorite Turkish recipes too. oh yum! have a great trip!!! I have also been very grateful to Ozlem and Claudia this summer to remind me of forgotten recipes or inspire me to new ones. Mmmmm this looks delectable - I love Turkish food! @Mary, I suspect I always will too! Wow - midye borek - that is some work, but definitely tasty! :-) Enjoy your Spain trip! @Ozlem, Of course! Love cooking your recipes in my kitchen. @Annie, Me too! Unfortunately, I was hoping to meet up with Claudia this trip but will just miss her. @if ands Butts, and Turkish food is quite simple to cook too! Enjoy! Last year I visited Turkey for a couple of weeks while living in Moldova and I loved the food, especially the mezze. I loved the mezze in Palestine too when I lived there. I could easily make a meal of them and skip a main course! Your photos made me hungry! Can't make anything now because my fridge is empty as I'll be leaving for France in a few days. Fortunately good food there too! @Miss Footloose, Yes, the mezzes are my favorite part too! One of the fish restaurants we went to this weekend, we did exactly that - only hot and cold mezzes and a salad! Yum!